After months of discussions around the conversion of Municipal District of Taber dryland leases to irrigation, a decision has been made. With council calling a special meeting for March 7 to further discuss the topic, a decision was needed due to the water rights deposit date coming the following day. Five quarters, NE 26-13-17 W4 (90 acres), NW 17-13-17 W4 (135 acres), NW 17-13-17 W4 (135 acres), SW 16-13-17 W4 (135 acres) and SE 27-13-17 W4 (135 acres) had been approved by the Bow River Irrigation District and all five leaseholders had given the M.D. a verbal confirmation they were wanting to move forward. One question council had asked was around pipeline easement agreements which would be needed. “Easement agreements were challenging in some aspects, not just with ourselves but with others. The BRID is not providing any additional conveyance to these lands so it is up to the applicant to get water to these quarters. You may have to cross several quarters of land to get to yours so through private easements on private lands,” said Brian Peers, director of municipal lands and leases. In terms of financials for the project, things looked almost identical from previous meetings. “The calculated debenture was done over two different criteria — one in 15 and one in 20 debenture. It still looks like the 20-year debenture would be more to cover our costs. There is a shortfall of about $20,000 per year with the 15-year debenture. There is a 16 to 17-year return of investment under either scenario,” added Peers. Even with the deadline falling the following day, if council were to move forward with irrigation they would most likely not see the water flow until the next year. 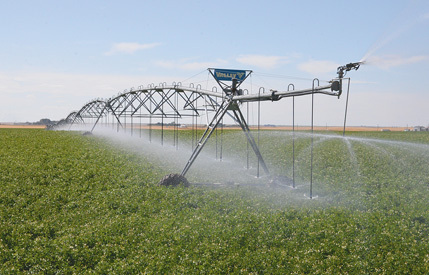 “I would suggest that if council decides to go forward with this, the majority of the acres would probably be 2020 to irrigated just being the short period of time from now until irrigation season,” stated Peers. A draft lease agreement was put forward to council though lease terms were still to be determined. With two possible arrangements, M.D. provided pivot or leaseholder provided pivot, there were a couple of different ways to move forward. “To me, if the leaseholder is investing in the pivot themselves, we would have to extend the lease term for them to realize the return. I would say if the M.D. is providing the pivot, that it would be a four-year lease with the potential to sublet for one year,” said Peers, who also stated he would like a 12 or 16-year lease for a leaseholder provided pivot as it would keep it on the four-year rotation. With payment for the $100 non-refundable deposit due on March 8, council asked if any revisions to the budget would be needed to pay the fee. “It wouldn’t require an amendment to the budget. If you gave approval for that expenditure today, we could pay it tomorrow. The Municipal Government Act just indicates all expenditures must be approved by council either through the budget, an interim budget, a capital budget or another method. A council resolution approving the expenditure is the same as approving a budget,” answered Bryan Badura, director of corporate services. Council was still split between whether or not they wanted to proceed with the conversion to irrigation. “I’m still of the same mindset, I’m not in favour of doing a debenture at this kind of money for developing just five quarters,” said Coun. Jen Crowson. Much like Crowson, Coun. Leavitt Howg has questioned whether the M.D. should be in the business of irrigation leases since the beginning. While he wasn’t totally against the idea, he was still hesitant to continue down the path of converting their cultivated leases to irrigation. Others though were still split on the idea. “That’s a lot of money but I guess the payments pay for themselves or pretty close. I’m still half on the fence and half off,” added Coun. Murray Reynolds. On the other side, councillors pointed to the fact the majority of the cost would be covered by the added rent. “Pretty well everyone I talked to said they were in favour of this. There was one who said we should still develop it and then sell the land. This is a zero cost. If there was a cost coming out of our operating to make this fly, I don’t think I would be in favour of it. The rent itself is paying for the whole cost. Is there risks? There are always risks but it is something that benefits the municipality,” said Coun. John Turcato. “The business plan is what makes the most sense to me, it is a no cost. The other factors that matter to me, we just came from the irrigation conference and they told us for every dollar invested in irrigation, it has a $3 return. At a time where our linear is going down and we are looking for alternative ways to earn money, this is one. Putting water on to land is a positive for our community and I am committed to the terms of the lease,” added Deputy Reeve Tamara Miyanaga. It was also pointed out that irrigation expansion wouldn’t be available very often. “I think it is an opportunity that has presented itself. We aren’t going to have irrigation available for a whole lot longer, there is a limited amount of water. I think it is an opportunity we have right now and we should take advantage of,” said Coun. Brian Brewin. While economic development was pointed out as a pro for moving forward, Reeve Merrill Harris stated either way they went, there would be an economic benefit for the M.D. With council giving their opinions, Reeve Harris allowed those in attendance to also give any feedback on the matter at hand. While not able to attend the meeting himself, Roy Brewin had Dawn Wiebe read a lengthy prepared statement opposing the project. Not being in favour of the M.D. moving forward, Brewin pointed to several objections including numerous denied opportunities to purchase land from the M.D. to convert to irrigation privately. Of the other two who spoke, one was in favour of proceeding while the other wanted to see the M.D. sell the land. “We have people asking us to sell and we have people who are saying ‘don’t sell because you will ruin our livelihood,’ so as a council we need to figure where we land,” said Tamara Miyanaga, who also stated she wasn’t opposed to selling either. A motion was made to proceed with the deposit on the water rights and was defeated 4-3 with Reynolds, Harris, Crowson and Howg opposing the motion.